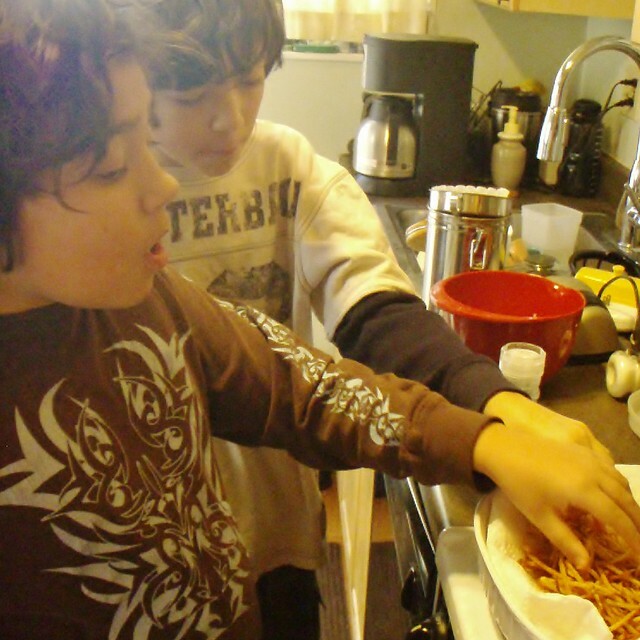 Quips, Travails and Braised Oxtails: Sundays with Sparky - Homemade Shoestring Fries with Avocado-Garlic "Aioli"
We moved!Don't miss our latest exciting installment! 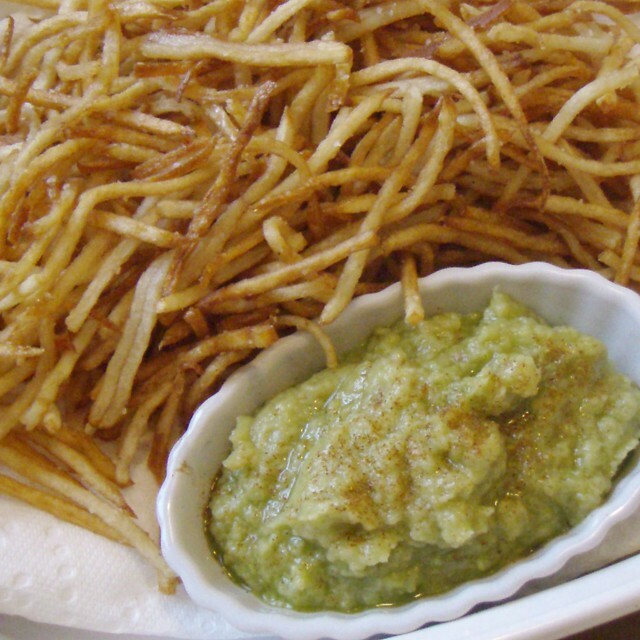 Sundays with Sparky - Homemade Shoestring Fries with Avocado-Garlic "Aioli"
Sparky's buddy, Dr. Lasergonopus, loves french fries. Actually *I* love french fries, but I'm something of fry snob: fortunately for me and quite unfortunately for my thighs and belly, I live in what is probably the gourmet french-fry epicenter of the universe! My friends at Wiener and Still Champion, Edzo's, and Bop-N-Grill, all take their fries seriously, and make french fries hand-cut directly from russet potatoes. I never make french fries at home, in part because the chefs above have related just how complicated it is to make a really good fry (it can be a two-day process,) but since we had Dr. Lasergonopus with us for an afternoon, I thought I'd take a stab at it. 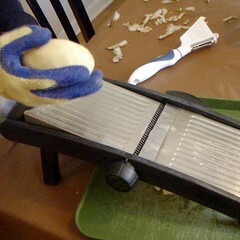 Second, once the potatoes are cut to your satisfaction, a soak to remove the outside layer of starch. This step is pretty simple, but critical: as you're cutting, occasionally stop and dump the cut fries into a container of plain water. Some of the starch will leach out into the water, making it cloudy but leaving the correct balance of pectins, starches and sugars in your fry. Third, the fries must be dried thoroughly to help them stay crispy and to help maintain the temperature of the hot oil as much as possible. 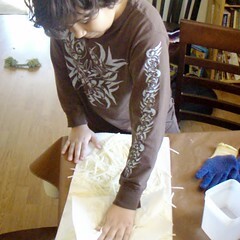 After draining off the starchy water, Dr. Lasergonapus dried them on several layers of paper towels. You will also need a good set of tongs, a spider/skimmer, ideally a candy or deep-fry thermometer, a bowl of cut, soaked, and dried fries, and a bit of nerve. Also, no kitchen should be without working ventilation, and a fire extinguisher and someone prepared to use it. 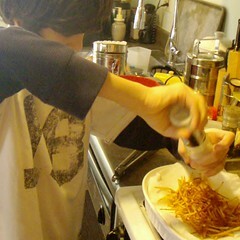 Using tongs, we gently laid the fries into the hot oil in a single layer (we made the fries in about four batches.) 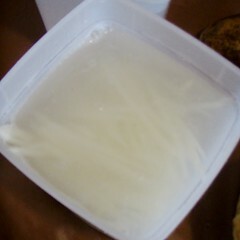 and allow to cook until they become limp like wet noodles, but still pretty much retain their raw color. Immediately remove them with the spider, draining off excess oil, to your "potato nap" station and repeat until all your fries are "napping." Again, using your tongs to gently lay the fries into the hot oil in a single layer, put your once-cooked, "napped" fries back into the hot oil (see how floppy and white they are before the second cooking?) and fry until they are crispy, golden-brown, and look good enough to eat. 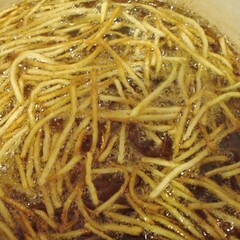 For tender fries, pull them just after they start to color and still "flop" slightly, as pictured. For extra crispy fries, leave them in until they're rigid. Using your spider, fish out the fries and lay them on the towels in your final destination. As soon as you're done, turn off the burner. 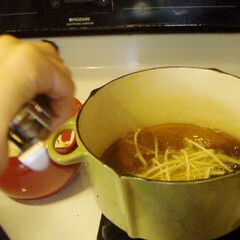 Allow your oil to cool slightly; turn your burner to medium heat. 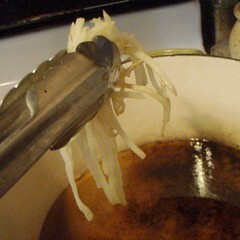 Put 5-8 unpeeled cloves of garlic into the hot oil, and fry on medium heat for about five minutes until the paper splits and the garlic gives gently when squeezed with tongs. 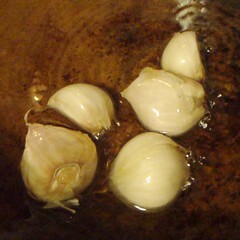 Remove, drain, cool lightly and peel; the garlic should now be soft and extremely mellow in flavor. 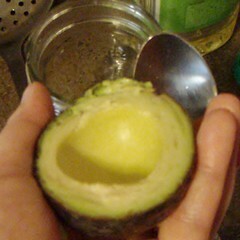 Place the garlic cloves in a blender jar or food processor with half an avocado, about a tablespoon of olive oil, and about 1/4 teaspoon of salt. Blend into a rich puree, adding olive oil as needed to bring it to the consistency of mayonnaise. Scrape out every last bit with a spatula into a serving dish; serve with a sprinkle of paprika and scoop it up with your excellent shoestring fries! Should you eat french fries every day? Probably not. Would you eat french fries every day if you had to save a block of time sufficient to make this recipe, follow all those steps, and then clean up the crazy volume of dishes? Probably not, either. Was it totally worth it this time? Heck yea! Quips, Travails, and Braised Oxtails by Michele Hays is licensed under a Creative Commons Attribution-NonCommercial-ShareAlike 3.0 Unported License.